Sperry Filter Press, 30" x 30", poly plate and frame. 28.38 cu ft. Bethlehem Filter Press, recessed polypro. 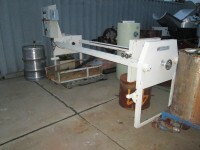 Eimco/Shriver Filter Press, 36" ploly plates, 7.8 cu ft.cake cap. Edwards Jones Filter Press Skeleton Frame. North America Pressure Leaf Filter. used Sparkler HRC-50 Filter, horiz. tank, rotating plates.